A practical introduction to LaTeX for new users, or those who want to refresh their skills. Each topic is presented as a hands-on project. 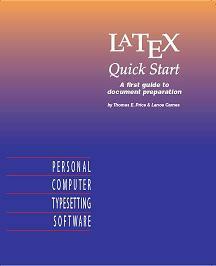 This guide may be used with PCTeX or any LaTeX editor. This book, written by Leslie Lamport, the original architect and implementer of LaTeX, has been updated to reflect the changes in the latest release of LaTeX. The book begins with instructions for formatting simpler text, and progressively describes commands and techniques for handling larger and more complicated documents. A separate chapter explains how to deal with errors. An added appendix describes what is new and different in LaTeX2e. This book by George Grätzer is for the mathematician, physicist, engineer, scientist, or technical typist who needs to quickly learn how to write and typeset articles and books containing mathematical formulas, and requires a thorough reference book on all aspects of LaTeX and the AMS packages, the enhancements to LaTeX by the American Mathematical Society. This reference by M. Goossens, S. Rahtz, and F. Mittelbach describes techniques and tricks needed to illustrate LaTeX documents, and answers common user questions about graphics and PostScript fonts. It provides the first full description of the standard LaTeX color and graphics packages, and shows how you can combine TeX and PostScript capabilities to produce beautifully illustrated pages. This book by M. Goossens, S. Rahtz, E. M. Gurari, R. Moore, and R. S. Sutor shows how you can publish LaTeX documents on the web. LaTeX was born of the scientist's need to prepare well-formatted information, particularly with pictures and mathematics included; the web was born of the scientist's need to communicate information electronically. Until now, it has been difficult to find solutions that address both needs. HTML and today's Web browsers deal inadequately with the nontextual components of scientific documents. This book, at last, describes tools and techniques for transforming LaTeX sources into web formats for electronic publication, and for transforming web sources into LaTeX documents for optimal printing. This popular book shows you how to begin using LaTeX to create high-quality documents. The book also serves as a handy reference for all LaTeX users. In this completely revised edition, the authors cover the LaTeX2e standard and offer more details, examples, exercises, tips, and tricks. They go beyond the core installation to describe the key contributed packages that have become essential to LaTeX processing. This book by Donald E. Knuth, author of TeX, is a complete description of TeX containing numerous examples and exercises. It is essential for those who want to write their own macros or become TeXperts. This book by R. Seroul and S. Levy is a friendly introduction to TeX. It contains a careful explanation of all fundamental concepts and commands, but also a wealth of commented examples and "tricks" based on the authors' long experience with TeX. The attentive reader will quickly be able to create a table, or customize the appearance of the page, or code even the most complicated formula. The last 1/3 of the book is devoted to a Dictionary index, summarizing all the material in the text and going into greater depth in many areas. This book by M. Doob is designed for the complete newcomer to TeX. It starts by showing how to typeset simple text using the defaults predefined by TeX. The situations and exercises covered slowly become more complex and include many different types of mathematical constructions and tables. The book can be used either as a tool to learn enough TeX to write standard papers of modest complexity or as a building block to prepare for more ambitious typesetting projects. This is the complete documentation for the AMSTeX macro package developed for the American Mathematical Society by Michael Spivak, who also authored the book. Exercises in each chapter encourage the reader to sit down at a computer and learn through experimentation. The book is great for technical typists, scientists, and mathematicians who want to format articles, books, and submissions to AMS journals. The complete guide to the METAFONT font creation program, by Donald E. Knuth. The book is a user's guide and reference manual which enables readers with minimal computer science or word processing experience to master the basic as well as the more advanced areas of METAFONT programming.